The year 2015 was a bad one for the bears who live and roam near the village of Cumberland. During last year’s bear season, seven black bears were destroyed within the village by conservation officers who were responding to calls by residents. The bears were destroyed because they had discovered that hunting for food in an urban environment is much easier than doing so in the wild. Unfortunately, that discovery led to their demise. For Townsend and a handful of other local residents, including the mayor, Leslie Baird, knowing that bears were being destroyed in the village was an unacceptable situation. Like Townsend, Baird had also witnessed a bear being destroyed right outside her home. From that initial meeting the Cumberland Bear Initiative was formed to promote bear awareness and lessen the number of bears killed in Cumberland due to human caused problems. Vancouver Island is home to approximately 7,000 black bears, one of the densest bear populations in the world. This is definitely bear country. 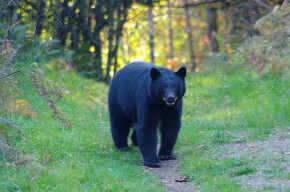 Furthermore, the Village of Cumberland sits within the Vancouver Island black bear population’s main migratory route. 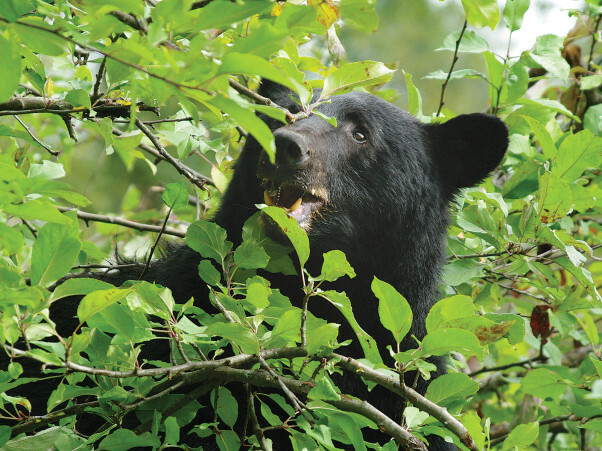 As a result, village residents have always seen black bears roaming through town. However, 2015 was an unusual year, with more bears reported and more bears destroyed. Michele Jones, a local biologist who has worked in the area for the past two decades, has noticed a change in how local bear populations move around during the bear season. 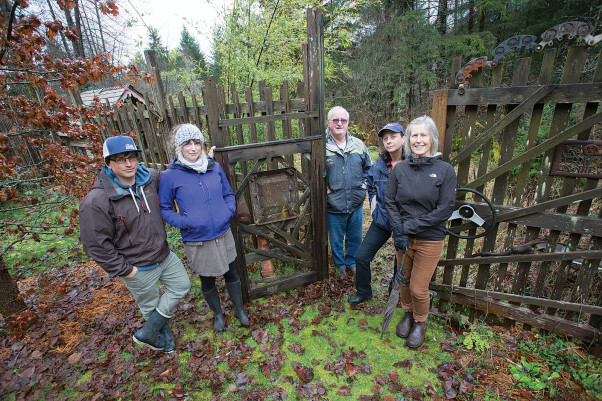 “Essentially, people are spreading out, and when we do that, we reduce the habitat available to wildlife,” says Jones, referring to why she believes the anticipated movements of the black bear populations are shifting—not just in our Valley but throughout BC. Essentially, humans are taking up more space, either from urbanization or from resource extraction. In addition, unseasonably warm temperatures decrease the amount of food available to bears. Dry summers like last year’s scorcher means there is less food for the bears. No rain often means no berries. When food scarcity occurs, the bears migrate to lower elevations in search of food. Understandably, it’s difficult to admit that we are the cause of the bear problem. Instead, some citizens blame the conservation officers for the fact that the bears are being destroyed. They perceive the conservation officers as coming into the village with guns blazing, but that’s not a fair assessment. In fact, when conservation officers are forced to kill problem bears it causes them anxiety and stress. According to their website, “During bear season, conservation officers respond to thousands of calls and complaints about bears. Most of these problems begin when people allow bears to access non-natural food sources. Conservation officers spend a great deal of time educating people about ‘problem’ bears, but the problems still persist. Human-caused bear problems are not just a public safety issue—it’s also a financial one. According to the Conservation Officers Services website, the government agency spends more than $1 million annually in response to bear complaints and relocating or destroying bears. As a result, the provincial government has initiated tougher laws to compel people to be more careful with possible bear attractants located on their property. It is now considered an offence for people in BC to feed dangerous wildlife or disobey orders to remove substances that can attract dangerous animals to their property. Those who refuse to comply face a heavy penalty of up to $50,000 and/or six months in jail. Clearly, the only long term solution is to prevent the problem bears from being created in the first place and that’s where the Cumberland Bear Initiative comes in. The main goal of the Cumberland Bear Initiative is to provide education to help reduce human-bear conflicts that result in the killing of bears. Household garbage, they say, is the number one attractant to bears, followed by other attractants such as pet food, uncleaned barbecues, bird feeders, compost bins, as well as orchard and garden produce. Residents can drastically reduce bear problems by managing these attractants so they are not a temptation to the bears that migrate through the village. To protect the safety of our own as well as our bear population, residents must do what they can to ensure that the bears use our urban areas only as a corridor… not a smorgasbord. Simply put, it’s not a situation of them or us. If we learn to change our habits, we can share space with our bear population. Store all solid waste behind closed doors in your garage, basement or secure area, or use bear proof containers. Only put garbage out on the morning of collection. Feed your pets indoors and store pet food indoors. Pick ripe and excess fruit and remove windfall on a regular basis. Harvest fruits and vegetables as they ripen. Don’t put food waste in backyard compost bins. Take part in the weekly curbside compost organics collection. Use bird feeders only in winter. Burn your barbecues clean immediately after use.